This month we introduce you to the ‘AbCollar’ — A business opportunity product for any of you aspiring entrepreneurs who are seeking a new and potentially lucrative business venture. The AbCollar was created by inventor and designer Wilbert C. Farris who was awarded a 2017 Minority Business Enterprise Certification. When you’re undergoing physical therapy and training, it is important to maintain a beneficial posture to get the most out of your recovery regimen. Maintaining neutral alignment and distance between your chin and chest (about a fist’s thickness) can be difficult when exercising. Let the AbCollar support your neck and reduce stress by holding it in place while you work out so you can perform more efficiently. Visit the AbCollar website to learn more about this beneficial product and the licensing opportunity that awaits you. You can click on the MagCloud link below or download the MagCloud App and search for TZelement MAG to order your printed/hard copy of our magazine (sent to you via postal mail) and/or instantly download a digital copy of our magazine to your computer or smartphone device. Our AUGUST 2018 POSITIVITY magazine features our talented Content Editor TJ Speaks. 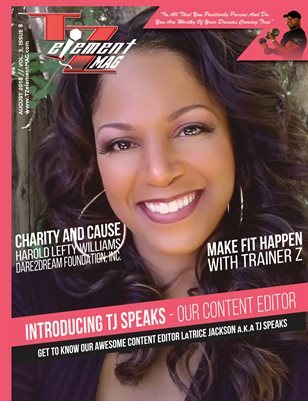 We also introduce the Harold Lefty Williams Dare2Dream Foundation, Inc. Make FIT Happen with Trainer Z, and more. Purchase your print and/or digital copy today!